Transhumanism is everywhere. We are being steeped in it like a tea bag in hot water. Not all the images are favorable, but shows like Almost Human, Intelligence, and Lab Rats and movies like the Bourne Legacy, Her, and Transcendence keep transhumanist themes always percolating, especially in the minds of those who will be most affected, our children. Artificial intelligence, human enhancements, and genetic engineering were the stuff of science fiction when most of us were young. These are within the grasp of today’s youth. Some would say they are inevitable. A good kids’ book delivers knowledge fundamental to living in the world, such as the (now apparently out of print) classic Everyone Poops. But Death Is Wrong, a new children’s title from transhumanist author Gennady Stolyarov, can only steer children toward confusion about mortality. 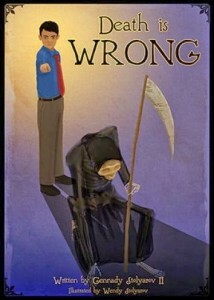 The book encourages kids to help eradicate death with technology…. Stolyarov sells kids an updated myth of pharaohs, the fountain of youth, and Gilgamesh cloaked in the singularity, the theorized point at which technology and superior artificial intelligence fundamentally alter life. He implies that death is the Problem and that solving it will ensure smooth sailing, which is irresponsible at best and disastrous at worst. He mentions how much interest our accounts will accrue, how much free time we’ll have, and how we’ll treat Earth better since we’ll be around longer. But he glosses over the downsides, including the inevitable class divides and social strife that would arise from the continued death of those who can’t afford immortality. Vanquishing his own lifelong dread of death seems to trump the consequences. And that is often the transhumanist way: gloss over the inevitable creation of an under-class of humans that cannot or will not enhance and ignore the selfish reality of what sacrifices everyone else will have to make for the elite to live forever. All in an effort to assuage the fear of mortality. Technology has arguably made us the most narcissistic society in the history of man, but imagine the horror if technology takes death, the great equalizer, and turns it into something synonymous with weakness and failure. Much like those with genetic disease or disability today have to fight for proper medical care, I wonder if medicine in the future will be considered wasted on those who cannot afford radical life extension. If you are not a techie, this quest for immortality may seem like a ridiculous goose chase. But there are many who do not see it that way. Even Google is getting in on the “death is something to solve” bandwagon. Death may feel wrong when we are the ones left behind, but it is a part of our nature. This is how I know transhumanism is evil. Not only does it completely disregard the reality of what it means to be human, but it completely rejects the hard won eternity with our Father in Paradise. What better way to prevent us from claiming the reward purchased by Jesus on the Cross than to convince us that this mediocre existence is all we ever need and that death is nothing more than a problem to be solved? This article courtesy of Creative Minority Report.